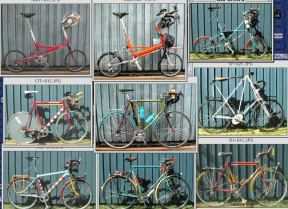 These pages are meant to be a collection of basic data pertaining to Moulton bicycles. In fact, any information that can be useful for the specific purpose of maintaining, restoring and improving small-wheeled quality machines in general, will be gratefully considered for inclusion. The contents is purely a result of the editor's personal interest in the subject, and there are no affiliations with neither manufacturers, dealers nor clubs. For information on the Macintoshes I use, please click here.